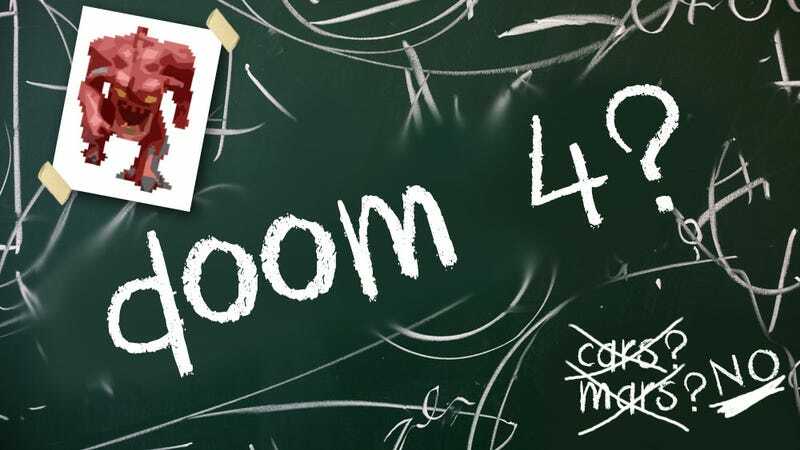 Doom 4 is in trouble, and has been for quite some time now, according to multiple sources. Though publisher Bethesda tells Kotaku they still plan to release the highly-anticipated first-person shooter, Doom 4 has gone through at least one major reboot over the past few years, and sources say even today, five years after development started, the game is not even close to complete. Rumors of Doom 4’s troubled development have been floating around for a while now, but over the past few months, we’ve learned a great deal more than what has circulated so far. I’ve talked to four people with connections to the Id Software-developed game, and they’ve described a studio plagued by mismanagement and lack of communication that has frustrated staff both at Id and Id’s parent company, ZeniMax (whose main branch Bethesda is the publisher of Doom 4 and a number of other games, including The Elder Scrolls V: Skyrim). We’ve also learned that in late 2011, after working on Doom 4 for three years, the studio behind the legendary series decided to reboot their newest game completely. Bethesda confirmed this to Kotaku yesterday. We’ve heard a great deal more about what’s happened at Id over the past few years, and bits and pieces about what’s happening now. Today we can share it all. At QuakeCon of 2007, Id co-founder and legendary programmer John Carmack said Doom 4 was on the way. In 2008 they made it official, and over the coming years, Id dedicated one team to Doom 4 and another to their other shooter, Rage, which would be released in 2011. Both games were built on Carmack’s fancy new Id Tech 5 engine. According to one source, Id originally imagined Doom 4 as a “rework” of Doom 2. This would establish a pattern started by 2004's Doom 3, which Id saw as a re-imagination of the original Doom. In Doom 4, you’d play as an average human being who was gradually cajoled into joining the Resistance—a ragtag group of civilians and military—to help fight legions of demons that were invading Earth. It was... cinematic. One sequence was described to me as “the obligatory vehicle scene” in which players would take the gunner’s seat of a car and shoot demons as the computer drove. If you think that sounds rather generic, you’re not alone. But a source assured me that there were some imaginative ideas in there too. These ideas might seem more than partially familiar if you’ve seen the screenshots that leaked in late February of 2012. Don’t get too excited, though. Those were all out of date long before they hit the Internet. Are These Doom 4 Screenshots? In late 2011, word came down that Doom 4 was getting a reboot. Id had just finished Rage, and according to three sources, leadership at the studio hadn't paid much attention to Doom 4 over the years. When Id's management finally did look at the game, they decided that it didn't live up to their expectations. It wasn’t good enough. And they needed to change direction. “I kinda think maybe the studio heads were so distracted on shipping Rage that they were blind to the happenings of Doom, and the black hole of mediocrity [the team] was swirling around,” said a source. All of my sources described Id as a company full of talent but lacking direction. Politics and mismanagement at the top of the studio had trickled down and negatively impacted all of their projects, so many people at Id were psyched about the reboot, even if it meant changing or discarding the work they’d done, one source told me. At one point, a source told me, the Doom 4 team had a big meeting in which company leaders talked about what Doom meant to them. John Carmack got up in front of everyone and said something like, "Doom means two things: demons and shotguns." Meanwhile, the Rage team had already started planning out Rage 2, a source said. But when the first game was released to tepid critical and commercial response, executives at ZeniMax decided to start getting more involved with Id’s development process. Over the next couple of months, ZeniMax met with Id’s leadership, cancelled Rage 2, and downsized plans for Rage’s DLC, the source said. The new plan, as of January 2012: refocus the studio, postpone or cancel all other projects, and get everyone on the fourth Doom game. “There was not only effectively another creative reboot, but a tech reboot,” said another source. Although this wasn't officially a reboot of the game, there was a new team and new code, so for some staff it felt like one. For at least a few Id staffers, the morale boost earned by the initial Doom 4 reboot didn’t last very long. One source described the scene as a “power struggle,” as managers from both Rage and Doom 4 tried to figure out how to merge their teams. “You’ve got these different cultures and they’re all kind of jammed together,” said one source. A different source described the direction of the game as a mess, even after the reboot. “Most of [Id’s] top talent has left or been fired,” said another unrelated source. “I know that people were leaving steadily through last year,” said a third. Doom 4 is now planned for the next generation of consoles, sources told me, and the actual release date is up in the air. At QuakeCon in August of 2012, Carmack said Doom 4 will be “done when it’s done,” but sources say “done” might be a long time coming. Two sources told me that earlier this year, frustrated with the lack of progress on Doom 4, ZeniMax came to Id with an ultimatum: make something happen, or else. The specifics of the threat are unclear, but there are plenty of rumors floating around Dallas, Texas, where Id is based. One rumor is that ZeniMax threatened to shut down Id if they don’t finish the game within the next year, but two people told me that seems unlikely. What’s more likely, sources told me, is that if Id can’t get Doom 4 together, ZeniMax could clean house and refocus the company to work on tech like the Id Tech 5 engine, which is currently being used for multiple projects at studios owned by ZeniMax. But Bethesda says that Doom 4 is still happening, and at least one of my sources remains optimistic that despite what’s happened so far, the game will be released... one day.